Sound Transit's Northgate Link Extension reached 70% completion, as project construction moves ahead to start service in 2021. 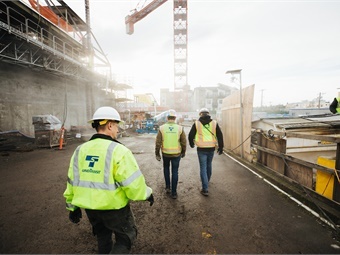 The project is a major component of Sound Transit's regional commitment to complete 116 new miles of voter-approved light rail, the largest rail service expansion in the country. Progress on Northgate Link construction includes track installation, which is nearing 50% completion. In addition, construction at each of the three stations on the extension has reached a significant milestone. The Northgate Station is approximately 70% complete, and the Roosevelt Station is nearing 70% completion. The University District Station is approximately 50% complete. When finished, the 4.3-mile regional light rail extension will offer riders traffic-free travel between Northgate and downtown Seattle in 14 minutes. Trains traveling in 3.5-mile twin tunnels north to and from the University of Washington Station at Husky Stadium will stop at underground stations in the U District and Roosevelt neighborhoods, exit the tunnels at First Avenue Northeast and Northeast 95th and transition to a 0.8-mile elevated guideway to reach the station. Sound Transit is simultaneously working to extend light rail north, south, east, and west, opening new stations every few years to form a 116-mile regional system by 2041. Northgate Link will be followed in 2023 by the opening of service to Mercer Island, Bellevue and Redmond's Overlake community. Additional extensions to Shoreline, Mountlake Terrace, Lynnwood, Kent/Des Moines, Federal Way and downtown Redmond are planned in 2024. Further light rail extensions are scheduled to reach West Seattle, Fife and Tacoma in 2030; Ballard in 2035; Paine Field and Everett in 2036; and South Kirkland and Issaquah in 2041. The agency is also working on further investments including but not limited to expansions of Sounder South service and bus rapid transit service in 2024 along the north, east and south sides of Lake Washington.